Fitness Blog What is Metafit and High Intensity Interval Training (HIIT)? Metafit is a style of HIIT and is designed to boost your fitness, rocket your energy levels & get massive results in the shortest amount of time possible. Everyone works at their own ability and pace unlike most classes where you all perform movements in sync.One can be doing the advanced option, going faster/deeper/higher while the other can be doing the easier exercise variation and slow it down. They both would still be working at their maximal effort because everyone’s maximal is different. Using more than one joint at a time. The exercises are designed to be functional and mimic everyday movements and muscles are built in symmetry preventing imbalances. Using lots of muscles at once will burn more calories, therefore is more efficient and effective. 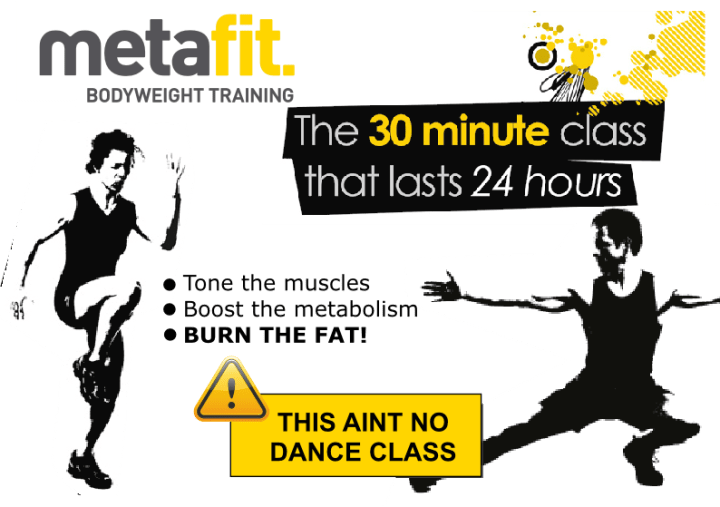 Metafit is loaded with core exercises. Unlike situps which work one particular muscle group in your abs, Metafit will work all the muscles in your abs, your lower back, shoulders and glutes at the same time. So be done with those out of date, time wasting, back breaking, ineffective situps. • It is not perfomed in the ‘fat burning zone’, it is designed to deplete glycogen stores in muscles to maximise Excess Post Exercise Oxygen Consumption (EPOC) to burn fat after the session (during recovery). • You will increase your Resting Metabolic Rate (RMR) and preserve muscle mass which is the single most effective way of burning fat. What Happens to Your Body in the After Burn? Al,THANK YOU once again for your INSPIRATION, GUIDANCE, and constant SUPPORT. I no longer recognize my own reflection in the mirror. You are truly amazing. I am 18kg down now. And will NEVER look back……… Thank you.